I’m just getting down to the nitty-gritty today. Q4tQ: what are your thoughts on the new “challenge” artifact appearances, and are you going to try to get them? So far, the only appearance I’ve seen that I definitely want is the fire mage one, since it looks like a titan sword; I went in there today at ilevel 875 and lasted maybe a minute. >_< But I’ll try again later. But I am glad that I can look at the appearances beforehand and decide if it’s worth trying. The Fury and Protection ones I find actively ugly, but I’m even more disappointed in the Arms one because it’s boring. It’s the same vaguely-Ulduar looking sword model as we got from several other skins. The biggest problem I have with Strom’kar (and we all know I love the lore behind that artifact) is that for whatever reason Blizzard didn’t really design skins with any real variation to them. The starting skin and the skin you get for completing the campaign, you kind of expect that, but then Wrath’s Edge and the Flamereaper and now the Sky Champion appearance all look samey. 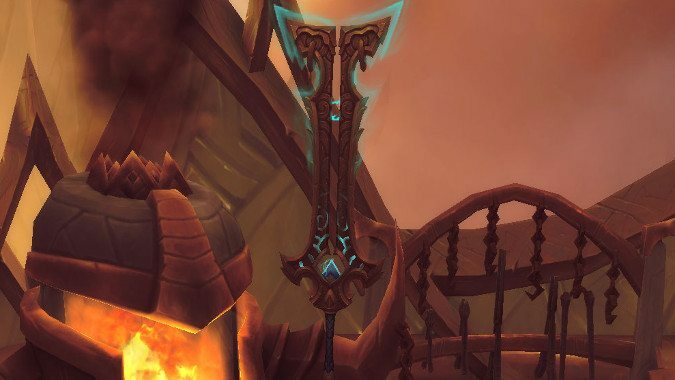 Not identical, and yes, you want them to be recognizable as the same weapon, but compared to the Ashbringer or Apocalypse, it feels like Strom’kar got ‘big, chunky Ulduar sword’ in it’s design notes and never got any further. I play Alliance and my favorite appearance for that weapon is the 2h axe, just because it’s a little variety. I’m sure I’ll get the Appearance eventually once we’re a little further into the expansion and I have time and interest in farming up a ton of Nethershards to run that challenge a few hundred times until I figure it out. Part of the problem for me is the eyesight. I know I’m going to miss a ton of mechanics that are going to rip my face off. Do you think we will ever see content that shifts the story status quo in game as much as 5.3 and 5.4? People forget how crazy that was. Led a second life out of orgrimmar for years and then I wasn’t welcome! It was a raid!! That was huge, looking back. Honestly, for me I think Legion may have really set up some really big changes to the story status quo. I know the Horde has gone through three Warchiefs since Thrall left (Garrosh, Vol’jin and now Sylvanas) but we’ve had Varian on the throne since Wrath, so losing him is huge. The combined shake up to the status quo of losing both Horde and Alliance leaders and Tirion Fordring, having Jaina ousted as head of the Kirin Tor, and the aftermath of whatever the end of Legion is going to be is setting us up for a huge shift in the game. So it could well happen. It appears that I am the only one who thinks Kul Tiras will NOT or should not welcome its princess back with open arms. Lord Admiral Daelin Proudmoore of Kul Tiras died on the job, due to his daughter’s meddling. Anyone, who is from Kul Tiras, who discovers this information will not be so impressed by her return. Nor, do I think, would the navy be inclined to lend ships to a known traitor. A pirate, she may end up becoming, if she was set on taking ships. But it aint going to be tea and sympathy for her return home. She isn’t the golden girl of Kul Tiras. She’s a mage of Dalaran. We really have no idea what state Kul Tiras is in. If, as may be the case, the Cataclysm damaged the island when it did whatever it did to move it off the coast of the Eastern Kingdoms, the presence of a powerful Mage might in fact be crucial to their survival. Calling Jaina a traitor to Kul Tiras is a stretch — yes, she stepped aside and didn’t save Daelin, but she did repeatedly try reasoning with him and he wasn’t the rightful ruler of Theramore, she was. He had no more right to supplant her as leader than he would have sailing into Stormwind Harbor and ordering Varian around. Regardless, the people of Kul Tiras may not in fact have any choice in the matter. WoW nations aren’t democracies. Kul Tiras was a hereditary monarchy and real history shows us that people have inherited the rule of a nation with the actual blood of their predecessor on their hands. Sure, the people of Kul Tiras might in fact not want her in charge. But if she showed up and pressed her suit, they might not have any choice but to say ‘well, she is the rightful ruler’ and appoint her Grand Admiral, whether or not they want her in the job. Especially since she’s a ridiculously powerful Mage and could likely incinerate anyone who tried to stop her. I’m willing to accept there would be some citizens of Kul Tiras who would be upset with Jaina’s actions when Daelin took over Theramore, mind. I just don’t know that it would stop her. Then again, this might well be moot. We have no idea where Jaina is right now. The new inky black potion is great and all but why did Blizzard make it a “limited”(isn’t always around) way to obtain it? I admit, I’m not sure. If you want darker nights, I can only assume the way the Inky Black Potion works is a personal buff that is somehow easier for them to implement. Why it couldn’t just be a graphics setting is way beyond my pay grade. Or maybe they just thought this way was more fun. Since we don’t actually know how much more life is left to Legion (for all we know, there could be a patch 7.4, 7.5, even more than that) it’s very hard to say if we’ll be on the Broken Isles for all of it. If we end up with Argus as a zone similar to Suramar or the Broken Shore, then it absolutely could be the case that we won’t be able to fly there. I’d even consider it likely — Blizzard seems to see flight in current expansions as a catch up mechanism once the content is no longer entirely current, so if we were on Argus fighting the Legion on its home ground it would stand to reason that we wouldn’t be able to fly there until we wrestled their control of the skies from them. Okay, that’s the Queue for today. See y’all Friday.